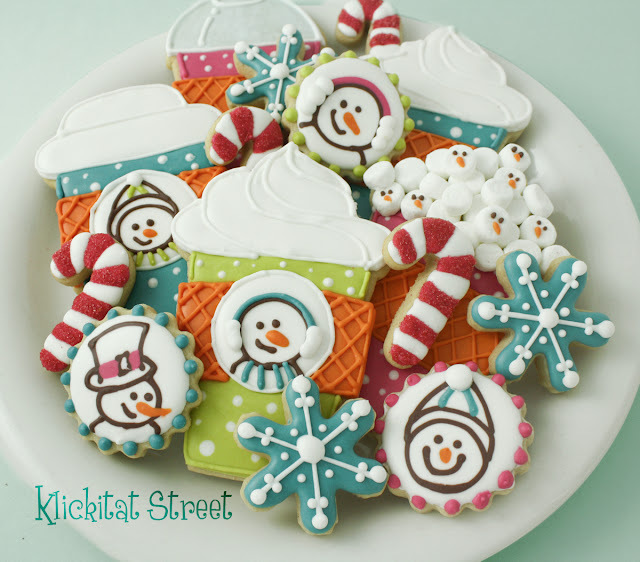 One of my first projects when I started decorating cookies last year were these Christmas Latte cookies. 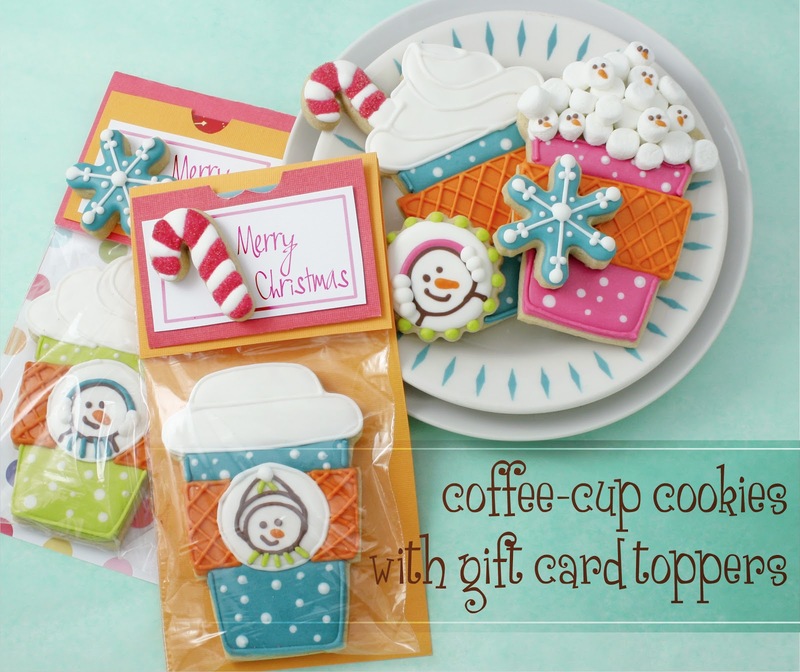 I always thought they would be cute cookies to give along with a gift card especially if you have someone who likes coffee houses on your list. 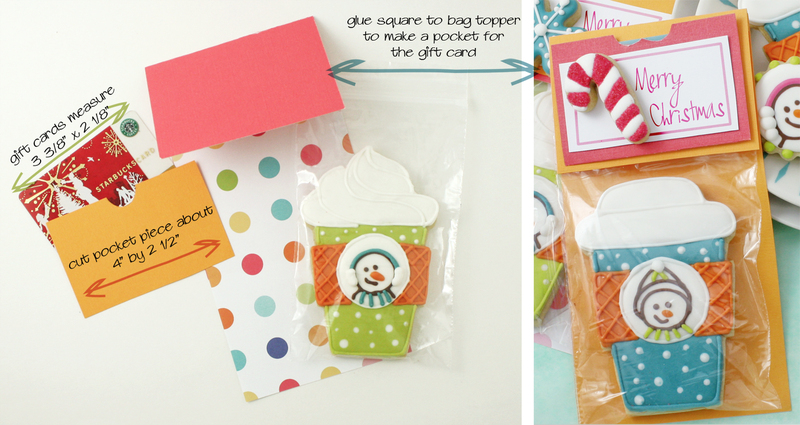 So I decided I would make them again and include a super easy DIY gift card topper too! When I first made the latte cookies I used a cupcake cutter and hand cut the sides down a little longer to make the cup. That works okay but I don't like hand cutting cookies so I came up with a new way. I also like this way better because there's also a space for the cup-cozy wrapper. For these cookies I used a cupcake cookie cutter and a wedding cake cookie cutter. Both cutters are sold in a party set by Wilton and are available at most craft stores. Cut both shapes from your cookie dough. Use the long edge of the wedding cake cutter to trim both shapes. I use this cake cutter quite a bit for making straight cuts like this and cutting little corners. Piece the two shapes together before baking. Be careful with the pieced cookies until they have cooled completely so they won't break at the seam. 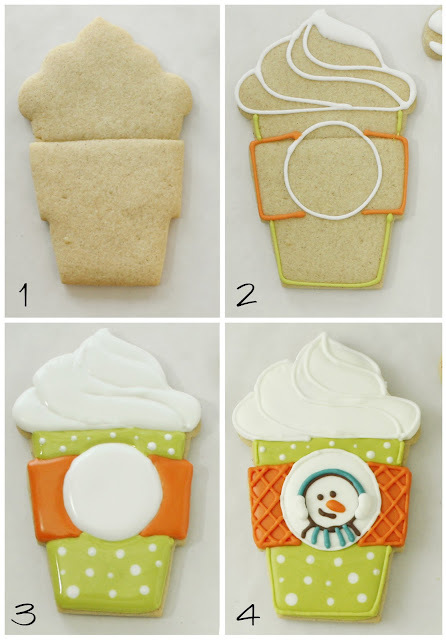 Outline the cookie in piping icing. You'll notice I filled the little peak of whip cream in the piping stage. Tiny areas like this often get cracks or craters in them while they are drying and filling them in while the lines are wet helps prevent that from happening. Flood the cookie letting each section dry a bit before filling the ones next to it. The "snow" dots were added while the flood icing was still wet. Let the flood layer dry for several hours or overnight and then add all the fun details with the piping icing. To make a simple gift card topper to go with these cookies, or any cookies, start with a sheet of card stock. Cut the card stock at least 4" wide. Standard sheets are 8.5" by 11" so you can get two from each sheet but if your cookies are wider then cut accordingly. Fold about three inches from a long end of the card stock down to make a flap and staple or tape a bagged cookie under the flap. Cut a small card stock rectangle a little larger than the gift card and cut a small notch at the top. Glue the rectangle to the front of the flap to make a pocket. Gift cards measure 3 3/8" by 2 1/8" so you want to add about a quarter of an inch to each side and to the bottom so you have room still slip the card in the pocket once it's glued down. Embellish your topper as you like! Christmas is coming up fast, I hope all your plans are going well! I don't really have color recipes, instead I mix everything like a painter would adjusting the colors this way and that. This blue started as leftover icing from an earlier project and was more like a primary blue. It was probably made with royal blue and a little black. To mix the blue here I lightened that blue icing quite a bit with white icing and then added a tiny bit of golden yellow to make it just a little greener. Sarah is the cookie you put the marshmallows on another latte cookie too? Yes, the cookie with the mini marshmallows was cut just like the others. The top is a cupcake shape where all the marshmallows are "glued" on with small dots of royal icing. I am hooked to your work! Speechless! Absolutely adorable, where could I get these cookie cutters from? The bigger craft stores should have this set in stock.